The cult of Glossier reaches far and wide, and it takes a strong soul to resist. Innovative formulas, "I must have it" packaging, and 20 percent off codes everywhere you turn — the Glossier need comes for us all eventually. Shipping has always been the one downside for instant gratification addicts, but a kind wind is a-blowin'. In a blog post on Into the Gloss, founder Emily Weiss snuck in huge news for everyone who's ever wondered, "Is there a Glossier store?" Weiss wrote that firmed-up Glossier plans for the future include "launching products in two new categories, opening permanent retail (see photo above — more on that soon), and yes, finally going international." Short 'n' cruel, but the brand knows how to leave us wanting more, as evidenced by the build-up to every product launch they've ever had. Commenters on the post promptly got to speculating about everything, but there's no definitive timeline yet of when or where the Glossier store will be opening. 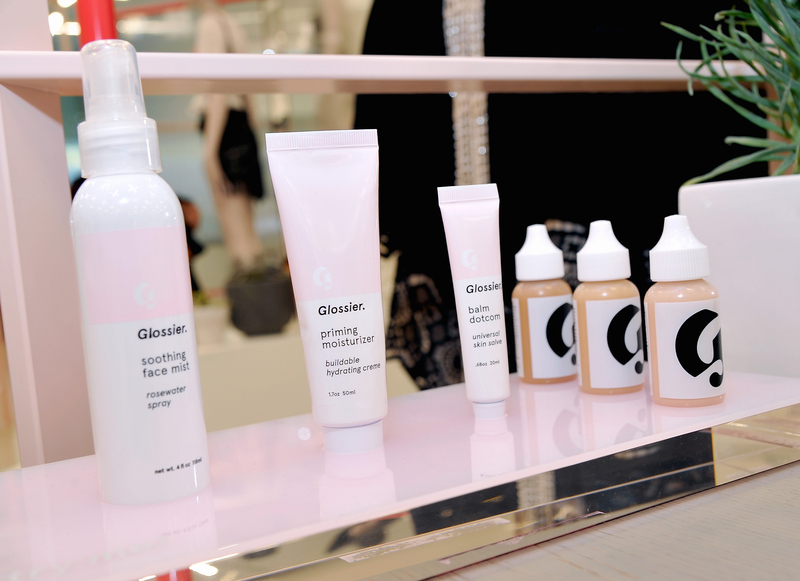 If the store follows in the footsteps of Glossier's summer pop-up store, it'll likely be in New York City (and pale pink will prevail as far as decor). The post's photo features an airy, pink-walled space under construction, with a sink under a modular arched inset. Maybe for face washing on site? It'd be 100 percent on brand, and Glossier rarely delivers anything less. So the days of rueing shipping costs and obsessively tracking FedEx deliveries may soon be over, at least for some Glossier fans. Although given the popularity of the brand's pop-up store in summers past, it could become a tourist destination as well — good skin draws everyone. Some fans are really hoping for a store location not in NYC. While others are just telling it like it is. No word yet on how those trademark 20 percent discount codes will work in store, but if you have to literally bring a blogger with you to cash in... everyone will do what it takes.